Now ignored by the system that should protect him. Help us find him the loving home he deserves. My name is Max. People tell me I'm a very handsome fawn/white Pittie boy with golden eyes. I don't look in the mirror much, so I'll go with that! I haven't had a very good life. My original owner really wanted me, but his wife hated me. So, from the time I was a puppy she put me in the dark garage 24/7. I was so lonely!! I never had any toys or walks. Then one day the woman said she was “pregnant” (whatever that is) and used that as an excuse to make her husband get rid of me. He was very sad but she won. (She always won.) She wanted to take me to the kill shelter - said she didn't care that they would kill me in 48 hours. The husband and concerned neighbors took me to a foster. I LOVE my foster (and she loves me!) but she is too old to take care of me, and she has no yard for me to run. It's been a few months, so I'm really scared I'm going to the kill shelter. Memphis has so many homeless dogs and I don't have a rescue group. Can you adopt me or rescue me? I'm about 60 pounds. In good with people and small dogs. I'm afraid of larger dogs. I LOVE to go in the car! I spent so many years in a dark garage so I would love to have a small yard. I will give you years of love!! I will lay by your chair while you watch TV. I will give you kisses when you need them. I will protect your house. I will be loyal to the very end. I just need a chance. I have been unable to get local pit rescue to courtesy list him. Nor have I been able to get local rescue here in Memphis to just allow him to come to adoption events, since he “wasn’t their dog”. I have assisted in the rescue of 100s of dogs and contributed thousands to local rescue. I’m so distraught about my failure to help this dog that I’m going to take a break from rescue until such time that this dog is rescued. If I can't help one that is MOST in need, then I can't live with myself.. I can’t abandon this one because there are “easier” dogs to rescue. 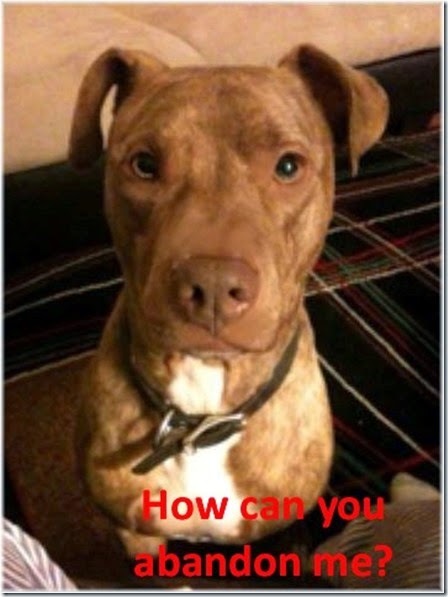 When we, as rescue volunteers, allow pit bulls to become a “throwaway” breed - and don’t even care if their lives are in in immediate danger – we have failed. Max’s only sin was having his life controlled by people who never loved him. He tried everything he could to gain that love, but was instead kept in a dark garage and then thrown out. See his story below. “Max has never had a loving home - something he richly deserves!! This is the dog that a pregnant woman did not want any more. She had been keeping him in the dark garage most of the time anyway. She attributed faults to the dog to justify her decision to to him to a kill shelter. Please see this INCREDIBLY beautiful... dog's pictures. He has been evaluated thoroughly by Bryan an expert at ProTrain. Per his foster, Bryan has said that Max as a very good dog! He has stolen our hearts! Max is an exceptional dog, and much loved by people who care about him and who want him safe and happy. Bryan, the evaluator, says Max is a very adoptable dog! He does extremely well with small dogs, and is in a foster home with small dogs now. Children ten and older would be great. Max is young, and he is insecure about storms because he was alone so much when he was a puppy. Max needs a loving home where he can lie by your chair and be your companion, which is what he is doing now with his foster - but his foster can't keep him much longer. She rescued him from his horrible life, but she is not at an age where she can keep him. Also, she doesn't have a yard, so Max doesn't get to run around in the yard and explore. Max is an inside dog but he needs to get exercise. He needs a reliable rescue group or loving permanent home. Please help Max find a happy place where he will be safe and protected, so he can have the life he deserves. Contact Sharon (below) for information as to how to rescue or adopt this precious boy. He really deserves and needs a loving, responsible, forever home where he will be there always as a great family member and companion. Transport available to reputable rescue or suitable adopter.